Real world experiences – Whereas the Oculus Rift lets users experience a virtual world, the Avegant Glyph concentrates more on the here and now. As Grant Martin, Avegant’s Head of Marketing and Product Development, explained to TechCrunch “the idea isn’t really to compete with Virtual Reality solutions, but rather to give people an option for a better screen-based entertainment experience wherever they happen to be”. The Glyph is intended as a mobile ear and eye headset, which people can use to watch films or to play games. It does display 3D content and has Bluetooth head-tracking technology which means that it could potentially be used for virtual type applications in the future. It’s all about the screen display – Even though I haven’t yet had a chance to play with the Glyph, I can imagine that its underlying retina display technology (see Fig. 2) will provide a whole new visual experience to users. The promise of this technology is “to transmit vivid, life-like images directly to the eye”. 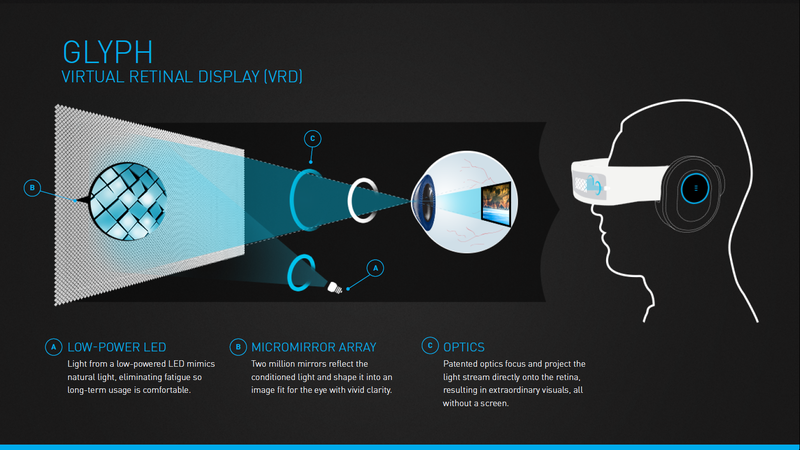 The optics which are part of Avegant’s technology focus the light rays directly on the user’s retina. It thus produces an perception of an image which is crystal clear, vivid and devoid of any pixel. Peripheral vision – The Glyph is designed to not completely block out the world around you and leave (some of) your peripheral vision intact. I’m keen, however, to see how much of my peripheral vision will be left intact once I put the visor down on a Glyph. 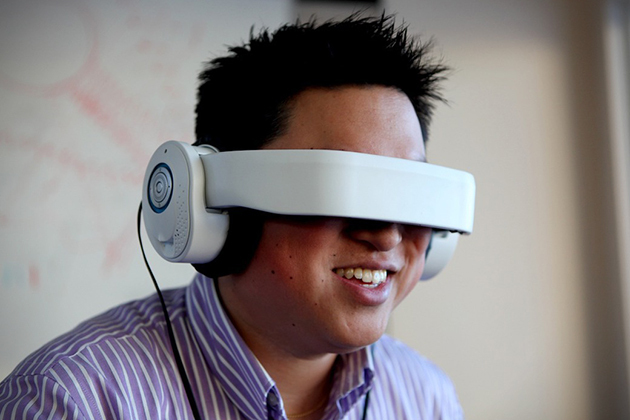 Main learning point: I can well imagine that the Avegant Glyph will be appealing to a whole new audience of users. Whereas the Oculus Rift is poised to attract an audience of gamers and people keen on virtual reality, the Glyph has the potential to reach out to more ‘everyday’ users who simply want a better visual experience than what they currently get on their smartphones or tablets. It’s not that you’ll be able to easily blend into the crowd with your Glyph, but its main uses cases are likely to make it a lot more accessible and appealing to a wider audience. With an expected price point of around $500 it will be interesting to see what the uptake will be like, but I’d definitely love to get my hands on a Glyph when it comes out next year!